The Children’s Pavilion in Kabul is a resting place for children awaiting medical treatment or convalescing. It is also a place for exchanging and sharing for all the families coming from all the provinces of Afghanistan. Those families predominantly come from rural areas where adults and children are often affected by water-borne diseases mainly caused by poor hygiene practices. 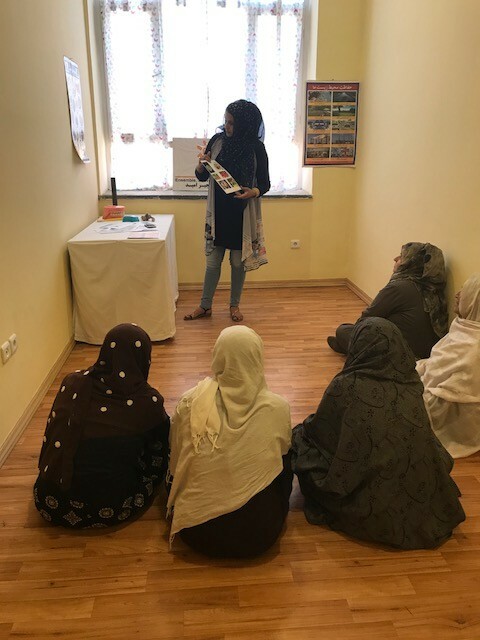 In order to raise the awareness of families on the importance of hygiene on health and to prevent the development of such diseases, the team of the Children’s Pavilion has implemented awareness sessions on hygiene. Sessions take place twice a week and are intended for the mothers and fathers of the children awaiting treatment. Various topics are discussed, such as body hygiene, hygiene in the home and food hygiene, in a playful and interactive way with everybody participating, using tools and accessories. At the end of each session, a nurse from the Pavilion takes some time to answer questions before organising a quiz on the various issues just covered. Parents truly enjoy those training sessions and so far, are grateful to have acquired new knowledge and share it with their family once they have returned home.